An event has occurred in the United Kingdom which is of utmost importance and its historical impact would be hard to overstate. As the December 11th date for a key Brexit vote in the British House of Commons nears, Theresa May’s government has suffered a truly historic defeat. Indeed, it was far more than a mere defeat. It was a historic rebuke. The British House of Commons voted to hold in contempt May’s cabinet ministers for withholding from the House of Commons key legal documents pertaining to the Brexit deal. What Theresa May’s government did was to give the House of Commons a mere summary of the Brexit deal. If my memory of previous media reports is correct, I think the summary was only 26 pages and the actual legal language of the deal is over 500 pages. I’m sure many readers are familiar with the maxim: “The devil is in the details.” Ms. May was essentially asking the House of Commons to vote on an agreement without the MPs actually being able to read the details of what is contained in the deal. Would you sign a mortgage loan document without reading it? Of course not. Yet that is what Ms. May has been asking the House of Commons to do. In vain did I look for anything in-depth on this story in the American media. The first link, from Al Jazeera, reports that this action of the House of Commons to hold in contempt Ms. May’s cabinet ministers is the first time such a draconian step has been taken in the entire history of the British nation! Faced with this action, Ms. May’s government agreed to quickly release the full legal documentation pertaining to the Brexit deal. This is truly historic. In the long centuries in which the British people have had a House of Commons, this link reports that never before has this step been taken. The second link and third link offer more details about the votes and the implications of what may happen next in the Brexit process. The third link reports that Ms. May’s government actually lost three votes in the House of Commons. One motion which would have essentially stalled any meaningful action regarding the unveiling of the actual legalities of the Brexit deal was barely defeated. Also, the Parliament gave itself the power to have the final say over any “Plan B” which the May government would put together if her Brexit deal fails in the scheduled December 11th vote. I think it is clear that the British House of Commons is taking unprecedented actions to assert its authority over the secretive government of Ms. May and to preserve the national sovereignty of the nation. It is worth noting the very pained expression on the face of Ms. May’s Attorney General when he realized all the legal ramifications and interpretations of Ms. May’s deal would actually be seen by the House of Commons and the British people. What is in the actual legal details of this deal that Ms. May’s government tried so hard to keep from Parliament and the British people? I enjoy watching the Prime Minister’s Question Time before the House of Commons which is aired weekly on the American PBS network. In a recent program, I heard a Tory (conservative) MP state that Ms. May’s deal “had a distinctly Remain flavor.” Indeed, as my recent post (Theresa May’s Brexit Betrayal) noted, Ms. May was originally in the Remain camp but somehow emerged as the new Prime Minister even though she had been on the losing side of the national Brexit referendum. As an American observer of British politics, I truly don’t know how that could happen, but her appointment was clearly done, in my opinion, to have the Remain side subvert the public vote on the Brexit referendum. My post cited the reasons why I regarded her Brexit deal as a betrayal of British sovereignty. Many others have agreed with this same viewpoint. The fourth link contains an insightful analysis by a former Governor of the Bank of England regarding Ms. May’s deal. He aptly calls it the “worst of all worlds” for the United Kingdom, and I urge readers to take the time to review it. The United Kingdom is currently the prime battleground between the globalists led by Ms. May and the nationalists who oppose the Brexit deal. It is evident from the information in the cited links that those united in opposition to Ms. May’s plan have differing agendas. Some want a clean break with the EU which restores full national sovereignty for the UK. Others, especially those in the Labour Party, want the Brexit crisis to result in new elections which could produce a new government. Some in the Tory majority do not want new elections but do want a different Brexit deal and a different Prime Minister. If Ms. May’s deal is voted down on December 11th, those who blocked it are likely to divide into separate camps pursuing varying follow-up agendas. The links report that Ms. May’s government would have to develop a new Brexit deal within 21 days. The EU obviously doesn’t want to negotiate a new deal as it had successfully forced British capitulation on practically all important matters in this abominable deal cobbled together by Ms. May in cooperation with her globalist friends in the EU. However, the EU leaders may have to choose between a Hard Brexit or negotiating a new agreement which is more reasonable. I’ll close with some biblical observations on this historical matter. Many readers of this blog and those who have read my books realize that abundant evidence exists that the British people are the modern descendants of the Israelite tribe of Ephraim, one of the two halves of the tribe of Joseph which inherited the birthright blessing originally given by God to Abraham’s descendants. The United States of America is primarily the nation descended from the Israelite tribe of Manasseh, the other half of the tribe of Joseph. In Genesis 48-49 the Bible records prophecies about the locations and characteristics of all the latter-day tribes of Israel, but it devotes the most information to the tribes of Joseph. Genesis 48:14-21 record that Ephraim and Manasseh would grow together “into a multitude” in the “midst of the earth” and that they would have the names of Isaac, Abraham and Jacob (Israel) upon them. Genesis 21:12 foretold that the birthright descendants of Abraham would have the name of Isaac upon them. After they were exiled to other regions of the earth, the scattered Israelites grew very numerous, just as Hosea 1:10 said would happen. The Israelites founded the Asian empires of Scythia and Parthia. The Scythians were called “Sacae” by the Greeks, the “Saka” by the Persians, and finally the “Saxons” by the Romans. All these terms are derived from the name Isaac. One Parthian city was even named “Asaak” as my book on Parthia documents. Genesis 48:19 prophesied that although Manasseh would be a single great nation, the Ephraimites would found “a multitude of nations.” Indeed, the Americans and the British descended from the same Anglo-Saxon roots, and while the USA is a single great nation, the British nations include the United Kingdom, Canada, Australia, and New Zealand and the British Empire once ruled over a massive number of nations around the world which are still linked together as a Commonwealth of nations. Judges 12 records that in the aftermath of a rare battle between the Manasseh and the Ephraimites in ancient times, the defeated Ephraimites could be identified because they “dropped their h’s” in saying words. This trait has long been identified with the British people in the modern world, a point humorously made in the famous musical, My Fair Lady. One cannot argue with a genetic trait like this. The modern Ephraimites, the English, still have this genetic trait. Genesis 49:22-26 prophesies that in the latter days, the blessings of the birthright given to Abraham would be inherited by the tribe of Joseph (i.e. Manasseh and Ephraim). This prophecy has been literally fulfilled as all the prophesied blessings of Abraham’s birthright have been poured out upon the English and American peoples. Indeed, one can see the wars and struggles of the 20th and 21st century as being about the efforts of other nations to wrest the birthright from the nations God gave it to. The globalists want to tear down the British and American nations and weaken or steal the “birthright” from them. I find it noteworthy that in Genesis 49:22-26, the prophecy admits that Joseph’s nations will be hated and attacked by enemies, but that God would strengthen them against those enemies. There isn’t even a hint in that prophecy that Ephraim and Manasseh will lose the birthright blessings in the latter days. 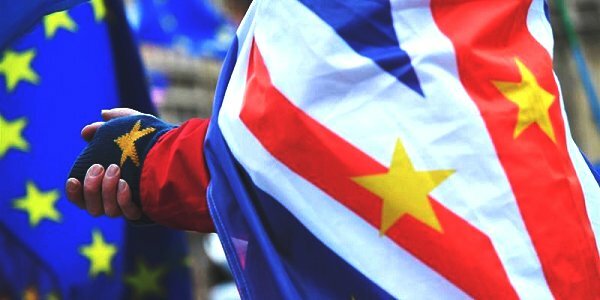 It may be that to ensure that the promised birthright blessings stay with the nations he gave it to in our latter-day times, that the Creator God himself guided the outcome of the Brexit vote and the election of Donald Trump as president in the USA. Both actions have had the effect of keeping the birthright in the British and American nations. If God is behind these outcomes with that intent, then I expect the efforts of the globalists to tear the birthright away from the British and American nations will fail. However, if that is not God’s intent, the British people are very close to “selling their birthright” to the EU just as ancient Esau sold his birthright to Jacob for a bowl of soup (Genesis 27). The voluminous secular and biblical evidence about the history, migrations and modern locations of all the tribes of Israel in the modern world can be found in either my E-book on the subject or my 4-volume book set–both of which can be obtained at my website’s homepage. I also urge readers to listen to my free audio messages on these topics at my website and also to read these free articles: Are We Living in the Biblical Latter Days?, The Israelite Origins of the Scythians and The USA in Biblical Prophecy.